The Wildcats celebrate their well-earned title. The final score was 67 to 59, but the game was closer than that. Right until the end, the Kentucky Wildcats just could not put away the Kansas Jayhawks. The Cats stormed out to a big lead, but every time Kentucky got the game closer to a 20+ point lead, Kansas would storm back, drag back within 10, and force Kentucky to keep working through the pressure. 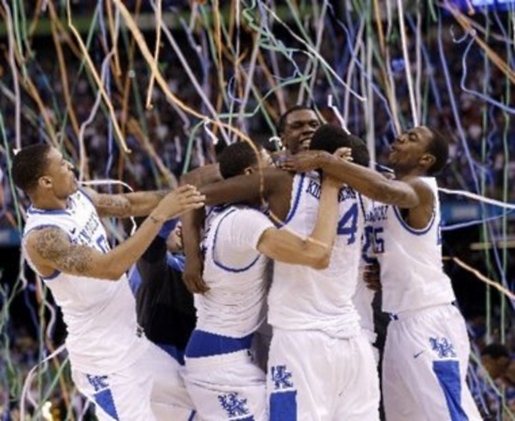 In the end, the Wildcats prevailed over the Jayhawks to claim the 2012 national championship. The clashing of titans meme surrounding the game between two of the best college basketball programs in the history of basketball was completely worth the hype. This is Kentucky’s 8th NCAA Tournament championship in 15 Final Four appearances. Anthony Davis, the Naismith player of the year, made the difference for the top-ranked Wildcats, who have been in the top one or two spots in the polls for all but a few weeks this year. Kentucky set a finals game block record with 11 rejections, which put the Wildcats over the NCAA record for team blocks in a single season with 344. Davis also ended up being player of the game. In spite of only scoring 6 points, Davis grabbed a staggering 16 rebounds, dished out 5 assists, 3 steals, and 6 impressive rejections.